I wanted to share with you a picture of me while I was running the 2011 ODDYSSEY half-marathon in Philadelphia. It's the image that I want the entire world to see: I'm looking confident, have a great stride and I'm at my best. When I work and go about my day, the confident me is the person that I like to be. But that's not reality. I'm not always 100% put together and feeling confident. Last week I received a phenomenal response from my Why Are We Silent? article. Women from Australia, Canada, the UK and all around the United States wrote me to tell me how courageous and amazing I was for sharing my story. But they also shared with me their stories of abuse, suffering and pain. I cannot express enough how touched at am from so many people writing to me and sharing their personal stories. I felt a connection had been built across the world through a silken web of words that bounded us together. But just like the picture of me running the half-marathon looking all confident and great, life isn't always like that. When we work with people, live with them and are in relationships with them, none of us are perfect. I would be lying if I were to say that I have not struggled in my own life. Just like my father, I have struggled with anger issues and have gone through many years of counseling as well as working the twelve steps for Adult Children of Alcoholics to help me in my life. When I was younger, I used to be ashamed of that. I used to think myself damaged and that I would never be whole. And to solve that problem, I would "find love and that together she and I would form a perfect bond and be together forever..."
Yeah, well, I didn't have a clue when I was young. But I'm older now, accept responsibility for the things I have done or said to hurt those I love and work on incorporating the twelve steps into my daily life. What I like about the steps is that it doesn't matter if you believe in God or not—all that matters is that you believe in a higher power (something greater than yourself) and that you let go of what you can't control. I couldn't control the actions of my father or mother, but I can take ownership of my own actions. How I live today and how I treat my wife, son and daughter. Why do I say that the secret to a happy life is looking at your own reflecting and saying, "I love myself"? I believe that truly loving yourself for all you are, both the light and the dark, is the foundation to build one's life. Without self-love (not narcissism or ego), than nothing else will truly grow in my life. 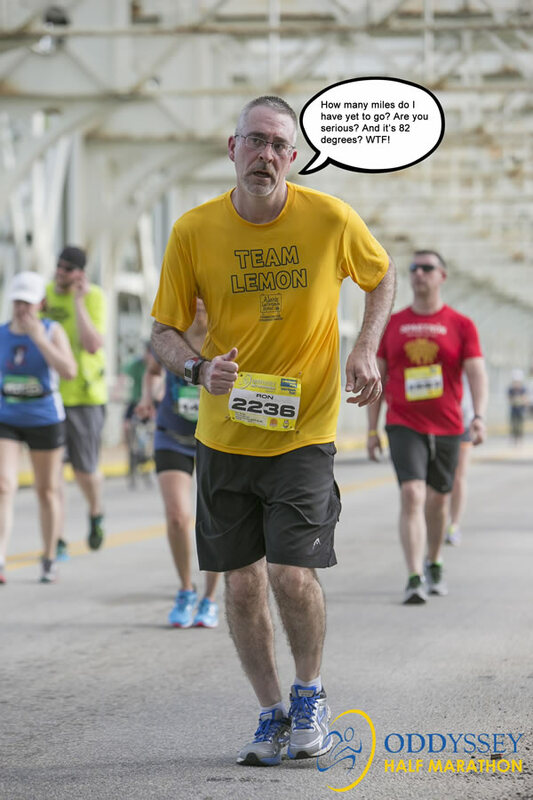 The picture of me with an Alex's Lemonade Stand Foundation "Team Lemon" shirt on is from last year when I ran the ODDYSSEY half-marathon. I did not have a good year. It was 82 degrees, I felt horrible and I had health issues from the heat for days after the event. I was at my worst. I share this photo with you because it's the truth. It's another side of me. It's when I'm feeling at my lowest and just want to give up. The world is all falling apart and I want to throw in the towel. But I didn't. I finished and was able to raise money to help find a cure for childhood cancers. When you go about your day today, will you do me a favor? Go to a mirror, look in it—really look at yourself and tell yourself that you love yourself. Speak the words, please, don't just think them. The words will set you free. I'm thinking about all of this because when I wrote Found (book 3 in the Cinderella's Secret Witch Diaries series), the key to the story is a part when Cinderella needs to make an enormously important decision. I struggled with writing that book because there's a lot of pain and suffering that I relived. Many readers wonder why Cinderella's life isn't all "happy ever after" and I know the truth. She needs to go on her journey and find her way. She, like me, struggles in life, but each day is doing better. In the meantime, here's a tease to get you in the mood for what's to come. 211 Org's amazing photo of the Waitomo Glow Worm Caves. Thank you for going on this journey with me and reading my books. In return, I do my very best to write powerful and entertaining books as honestly as I can. Newer PostWhat's It Take to Write a Book? Older PostWhy Are We Silent?